On 28th September 2017, BINUS UNIVERSITY hosted the 2017 Most Valued Business (MVB) Indonesia Annual Conference at its FX campus in Jakarta. The World’s Most Valued Business is an independent organisation that provides a platform to promote companies that undertake corporate sustainability practices within their respective industries. This year’s event themed, ‘Is Indonesia on the Road to Corporate Responsibility and Sustainability?’ opened by the British Ambassador, Mr. Moazzam Malik and featured seminars and presentation sessions from prominent experts NGOs and multinational companies, with speakers such as Kevin Kumala (Avani) and Daniel Mananta (Damn I Love Indonesia), as well as academics and industry leaders. The conference showcased companies that have demonstrated the highest critical standards in implementing good business practices such as through ethical employment, corporate sustainability, and environmental friendliness and good corporate values, among many others: through these important aspects, companies can try to ensure they are executing the mostresponsible business practices. The conference also served as a forum to exchange information and ideas on how businesses can convey their ethical business strategies to consumers, and to better collaborate with each other to improve efficiency. 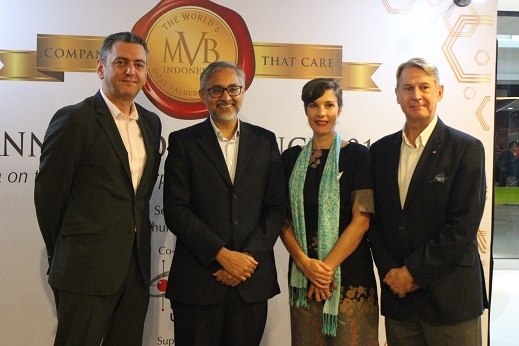 “It is an absolute pleasure to cooperate with BINUS UNIVERSITY for this Conference and to work together to try to improve Indonesia’s ethical and sustainable corporate profile.” Said Alistair Speirs, Chairman of MVB. “The example shown by BINUS in terms of its own corporate values and HR programs is really a good one for all companies to follow.” Alistair added. MVB and BINUS will continue their cooperation through research and case studies with prominent MVB members and extend the spread of the concepts of responsibility and sustainability through the entire student body.